Cruising boat on the Ba Be mountain lake. Riding throught the Phia Oac Nature Reserve. Visiting the Nguom Ngao limestone cave. Thang Hen lake on mountains. Leaving Hanoi noisy and crowded, group ride on Highway 3 via Thai Nguyen straight to Ba Be Lake. It is a large freshwater lake in the mountains. At the bottom of lake have thick clay layer prevents water from flowing out. Arrival to Ba Be Lake around 16pm. Overnight in Ba Be lake. You will wake up in the fresh air of the mountains. After breakfast, we visit Ba Be Lake by small boat. 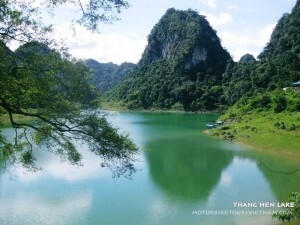 Running around on the lake, visiting a number of karst caves, the group will walk to some islands and admire the panoramic view of Ba Be Lake from these islands. 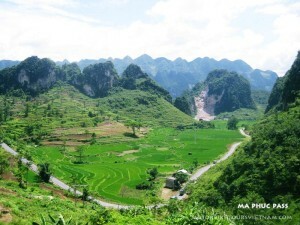 Afternoon, driving towards Cao Bang city, on the way you will visit the majestic scenery in the Phia Oac national reserve. You will drive through the Pine forests, High Mountain with zig-zag roads. 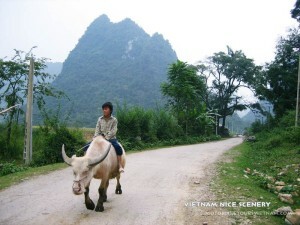 We sleep in Cao Bang. 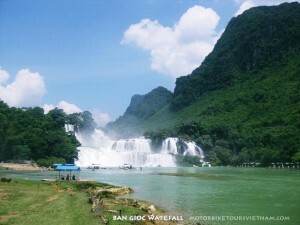 Cao Bang province has border with China, you can visit some of the famous landmarks of North East Viet Nam as: Ban Gioc Waterfalls, the historical Pac Bo, Phia Oac National Reserve, the majestic limestone mountains. This is also indispensable stop in our trip to explore the Northeast. Overcome the high limestone mountains, group gone the Ban Gioc Waterfalls, the most beautiful waterfalls in Vietnam, high is more than 53 meters. Waterfall has border between Vietnam and China, under management of the two countries. From halfway up the mountain, you can hear the roaring sound of flowing water. In the flood season you can see an imposing scene, the high water column down to fast speed creates clouds of white smoke covering mountains. After lunch, we drive to visit Nguom Ngao cave, you will have to walk about 2km through the valley to reach the cave. This is the natural limestone caves, where you can feel like you lost in the dream-land. Last, we come back to the hotel in Cao Bang city. 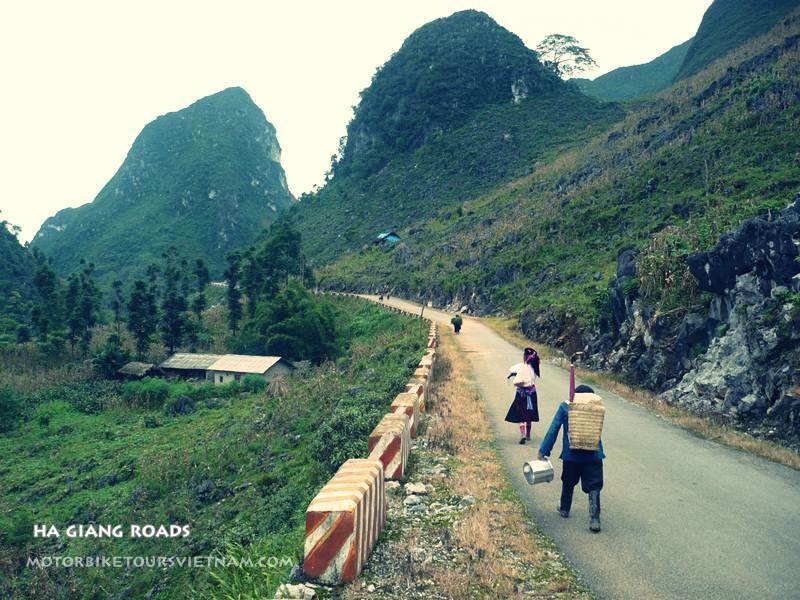 From Cao Bang to Mau Son Mountain, you will have to go through the legendary road National Highway 4A. The legendary roads are famous with many battles in the against French history, it is the path runs along the border with China. At Dong Dang border gate we will stop to visit the “Friendship Gate” on the Chinese border. And then driving to Mau Son Mountain, a high mountain, fresh air like Sapa or Da lat, in the winter the temperature can be down to 0 degrees Celcus. Overnight in Mau Son. The last day you can wake up later, after 4 days of driving tired. 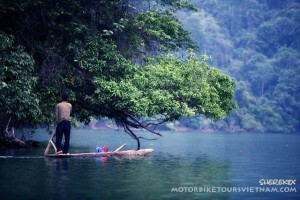 Down the mountain, they will run Highway 1A to Hanoi. Back to Hanoi around 17pm. End the trip.